The PhD thesis research of Jian Wang showed that tunable synchrotron light focused in a STXM can generate chemically selective patterns in multi-layer polymer structures [1,2]. However , the spatial resolution achieved was 150 nm or worse, due to radiation damage spreading and the need to use high doses to have sufficient contrast for STXM analysis. Adam Leontowich has found if patterns are generated by STXM and then chemically developed, much higher spatial resolution can be achieved - but the development is not actually needed to show high resolution. 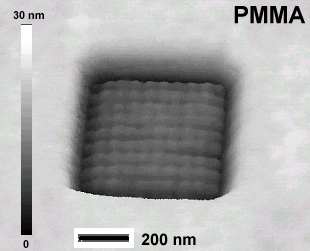 The figure shows an AFM image (Quescant 350) of a 10x10 shot damage pad burned into a 40 nm thin film of PMMA using a dose of 120 MGy (200 ms @ 11 MHz, 300eV) - prior to chemical development. Each individual damage exposure (30 ms) is visualized. With appropriate methodology patterns with features as sharp as the known spatial resolution of STXM (30 nm) can be made.